NanoDiode Work Package 4 – EDUCATE concentrates on nanotechnology education and training. The work package aims, first, to build a robust education strategy based on available resources provided by earlier projects, and second, to carry out a series of education activities focusing on secondary education, building on the extensive experience gained in earlier European projects. Thirdly, WP 4 aims to establish a multidisciplinary community of practice that will create a capacity-building module for health and safety governance of nanotechnologies at the workplace. The need for education features prominently in European policy texts such as the European Commission’s Strategy for Nanotechnology of 2004 and its Nanosciences and Nanotechnologies Action Plan of 2005, which aims to ‘Promote networking and disseminate ‘best practice’s for education and training in N&N.’ Along with similar policy mandates for education on European member states and in other parts of the globe, this has resulted in a wide range of nanotechnology education activities over the last decade. 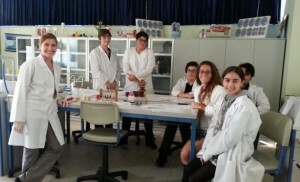 The European project NANOYOU for instance organised a range of education activities such as a poster, film, contest, virtual dialogue, cards, role play, lab experiments, puzzle and games, and a website in 13 languages. In a similar fashion, the European project TimeforNano developed a range of educational materials and events (News & events, a video competition, a NanoKIT, a quiz and a website in 9 languages). The recent compendium for educators made on the basis of NANOYOU and, to a lesser extent, TimeforNano presents an extensive overview on the relevant principles, applications, implications and hands-on activities for nanotechnology education. There is a range of further initiatives: the EU projects NANOPINION and NANOEIS are currently preparing educational materials. On a more general level of science education, the EU project inGenious – the European Coordinating Body in Science, Technology, Engineering and Mathematics (STEM) Education, a joint initiative launched by European Schoolnet and the European Roundtable of Industrialists (ERT) – aims to reinforce young European’s interest in science education and careers and thus address anticipated future skills gaps within the European Union. The National Nanotechnology Initiative, a major US initiative on nanotechnology, has similarly developed a wide range of nanotechnology teaching activities. Combined with a plethora of activities on national and regional levels, the question for nanotechnology education is not what education materials to develop, but how to make best use of the available material. WP 4 will review and evaluate European nanotechnology education as part of its objective to define and assess best practices. Instead of reinventing the wheel, WP 4 aims to identify the most effective, useful elements within nanotechnology education and to roll these out within classes in Europe.